I was going to tell you about another chateau today, but there are more pressing matters at hand. Instead of long-dead French nobles with too much time and too many resources at their disposal, we’re going to talk about strawberries. Aussie farmers are doing it tough at the moment with widespread drought. In the past week or so, though, we’ve seen a $500 million (or thereabouts) industry be brought to its knees by a few idiot saboteurs with sewing needles – the Queensland strawberry industry. What you might not know is that South East Queensland – and predominantly the Sunshine Coast from Caboolture and up through to Bundaberg – supplies Australia with its winter strawberry crops. The season runs between May and October. We’re talking hundreds of thousands of punnets of the best tasting strawberries you’ll eat. The supermarkets may have pulled their strawberries off the shelf, but we’re still buying them from the markets. The alternative is to watch them being dumped – and the farmer’s livelihoods with them. Radio stations and newspapers here on the Coast are imploring people to get behind the strawberry farmers and still buy strawberries – to cut them before eating if you’re concerned – and to share favourite recipes. Here are mine. What are we doing with them? We’re eating them – for breakfast with yoghurt and granola and passionfruit. We’re freezing them – for smoothies and trifles. And we’re macerating them in creme de cassis for a little bit of France in a bowl. You can, of course, also use them to make jam, top a pavlova or a Victoria sponge cake, or stir them through lemon curd and spoon it into little pastry cases for a quick and tasty dessert. 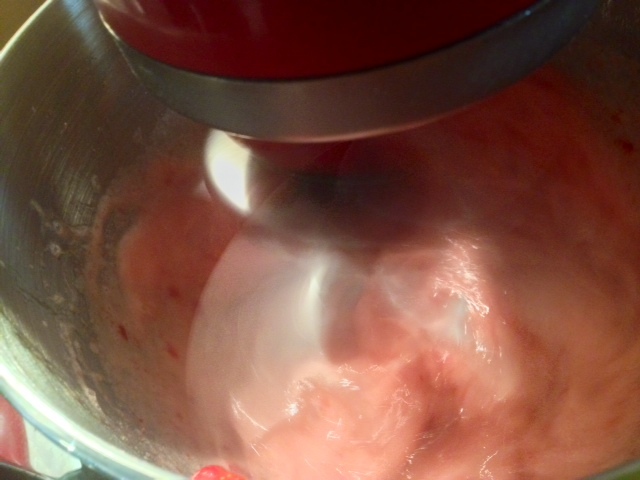 This comes out of the food processor looking just like a strawberry soft serve. 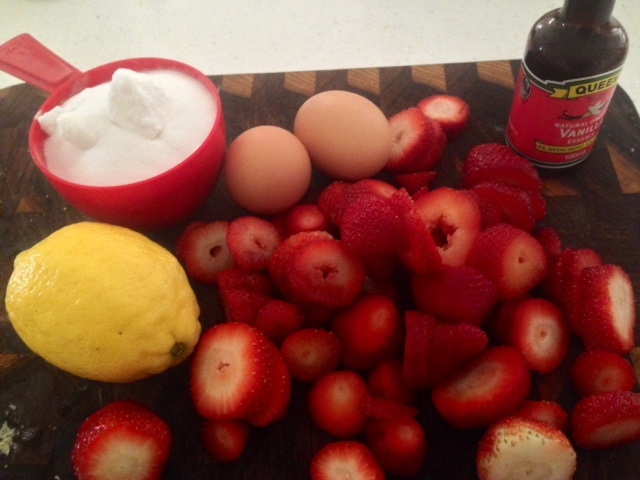 It’s just 500g frozen strawberries, 1/2 cup icing sugar and 1 egg white all blitzed in a food processor. Job done. An alternative to ice-cream is strawberry frozen yoghurt – although this one does need to be churned in an ice cream maker. The principle is similar. Take 500g strawberries and hull and dice them. Pop them in a bowl with 1/2 cup caster sugar and leave it for a couple of hours or until the sugar has dissolved. Pop the strawberry mixture into your food processor, add 1 1/2 cups Greek-style (full fat) yoghurt and process until smooth. 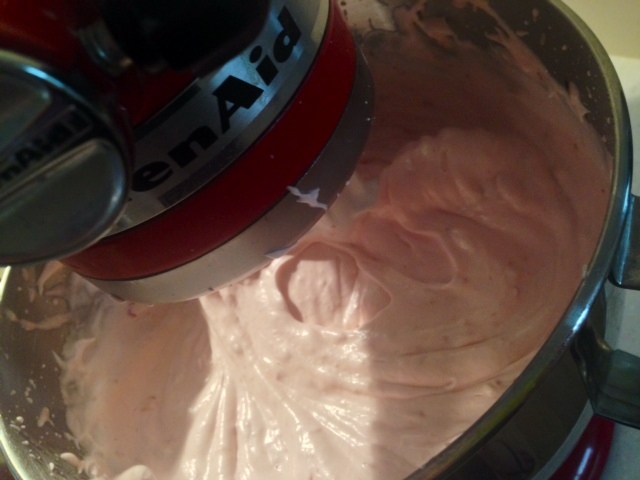 Then spoon it into your ice cream machine and let it churn for however long your machine needs to churn for. Then freeze. Anyone who spends any amount of time in the kitchen will have a party favourite in their repertoire – you know, that one dish that you pull out every time you have a crowd to feed. 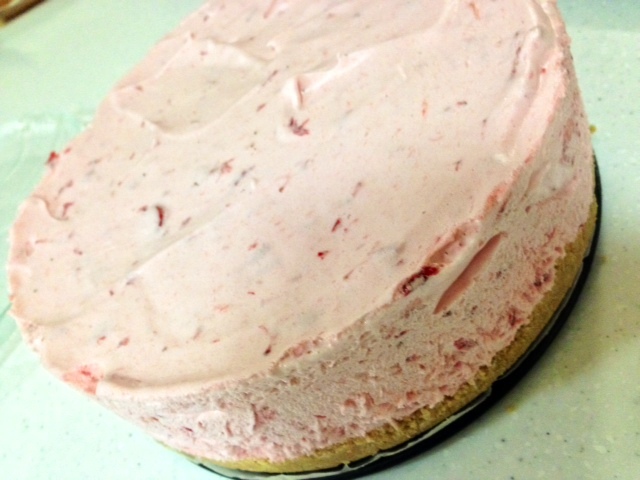 This Strawberry Cloud Cake is mine. It’s impressive, it’s pretty, it’s seriously easy to put together, it tastes good and it’s pink. In our house, trifles are hubby’s domain. He makes one once a year – for Christmas. He uses aeroplane jelly mix and cut up sponge cake. It’s a bit of a Christmas classic, and this one represents no attempted takeover of the Christmas trifle. For a start, there’s no powdered jelly mix in sight. 3 gelatine leaves. I used titanium strength – it’s a lot, but you need the jelly to be firm enough to hold the sponge fingers, custard and cream. Place everything except the gelatine in a saucepan and bring to the boil and then reduce to a simmer – for about 5-6 minutes. While the berries are simmering, soften the gelatine leaves in cold water. This should take about 5 minutes. Squeeze the excess water out of the squidgy gelatine and add it to the hot berry mixture. Stir until it’s dissolved, and set aside to cool for an hour before pouring into your trifle bowl – or bowls, if you’re being fancy schmancy. Put into the fridge to set for a couple of hours. Once the jelly is set arrange some sponge fingers across the top, drizzle with sherry, and top with custard. Of course, you can make your own – but it’s easier to buy the dollopy sort from the supermarket. Then it’s just a matter of spooning on some whipped cream and decorating with more berries. Do you have any favourite strawberry recipes? That problem has now been solved. Enter the Bowl…or The Decision Bowl, to give it its full title. The bowl, an old Chinese bowl which used to hold a candle that I’d bought at the markets one time, now holds folded pieces of paper on which are written Sunday lunch destinations. The process is simple: anyone can add to the bowl, with the draw happening on a Wednesday night – in case a booking or preparation is required. 1. It must be cheap eats or moderately priced. Nothing with the main course over $25. 2. It can’t be in a food court (that rule is for my husband). It can, however, be at a shopping centre as Betty’s Burgers has just opened at Sunshine Plaza saving us the trip to Noosa. 3. You can’t just specify a cuisine eg yum cha – you have to also name the restaurant/cafe (that rule is also for my husband). 4. You can’t write the same place down more than once (yep, also for my husband). 5. We can’t visit the same place more than once a month. The next time that spot is drawn out, you have to choose something different from the menu. A special event could impact access or parking eg Mooloolaba Triathlon. 7. Each member is allowed one veto a quarter and must thereafter smile and deal with it. 8. Every 6 weeks the draw will be made from the Brisbane Bowl. 9. Each person can exercise a wild card once a quarter and choose wherever they want – as long as it isn’t the Japanese noodle place at the food court in Sunshine Plaza (yep, that one is there for hubby too). 10. Hubby, as designated driver, retains a free veto for any distance over 40kms if he has driven over that distance in a single trip during the previous week. 11. Family commitments, special events eg birthdays, Mother’s Day, Father’s Day, or illness override all of the above. 12. No variation to the rules is permitted unless the whole family agrees. 13. Any disputes are to be adjudicated by Mum. 14. Kali, Adventure Spaniel, does not get a vote – mainly because she’d always agree with Mum. An old-school Queensland pub, we chose to eat in the front bar from the counter menu rather than head out the back to the dining room. The menu in the front bar is exactly what you’d expect it to be from a country pub and the meals are huge. Think chicken parmi, rissoles, fish and chips, steak sandwiches, or, my hubby’s misguided fave, lamb’s fry and bacon (eeeeeeuw). BYO wine and picnic basket. I’ve written about here before – on the Sunny Coast blog…you’ll find it here. What did we eat? Fish tacos, chowder with mussels, and mussels. Another relative newbie down at The Wharf in Mooloolaba. As an aside, I’m really loving what they’re doing down there – the place has come to life again. The menu is a good one, but we kept it simple with jalapeno poppers, chicken wings and flatbread burgers. We originally drew out The Beach House at Noosa – the front bar area – but I used my quarterly veto because I just couldn’t be faffed with the palaver that is trying to find a car park in Hastings St on a Sunday. Next out of the bowl was Rice Boi, a fave of ours. I’ve written about it too on the Sunny Coast blog. So I’ve been in Sydney this week. I complain and whinge and carry on about having to come down, but I don’t mean it – well, I sort of do. It’s great to see family and catch up with friends. And, while I have not missed the commute, it’s even okay to be in the office with real live people. And that’s not to take anything away from my usual office partner – Kali, Adventure Spaniel and Staff Engagement Officer. Anyways, I’ve been in Sydney, and I’ve been working hard and playing just as hard. I was going to cheat and update an old post about Masterchef challenges, but instead, I’m going to cheat and share some pics from when I was out and about in the city on Sunday. I met my friend at Queen Victoria Building, and we walked down to Darling Harbour, and around to Barangaroo. Even in the 12 or so months since I’ve been gone this area has come on leaps and bounds. Oh, and no filters in the pic below – it really was that blue…and icy cold. From here we continued to Barangaroo Reserve. On a clear day, the water is impossibly deep blue and truly does sparkle. Then it was past Walsh Bay and under the Harbour Bridge. It’s down here by the harbour on a day like this that I see the Sydney I love. It is a picture-postcard perfect city, but I while I enjoy visiting I don’t miss living here. Lunch was at an old favourite – the Opera Bar – with an old favourite…not that she’s old, but she’s one of my favourites…oh, you get the idea. After lunch, we took another walk – this time through the Botanical Gardens so that I could visit a tree. Yes, a tree. This tree is a massive Moreton Bay Fig, and it has a starring role in Happy Ever After so I wanted to make sure that my memory of the tree was accurate. It’s Australia Day tomorrow and these days the concept of Australia Day is – to me and many other Australians – a complicated and conflicted one…so we’re not going to talk about that. Anyways, given that this is a politics-free site, and given that it was my Mother’s birthday just 2 days ago, I want to chat about a classic Aussie dessert. I use the term “classic” in its loosest possible reference – in that it’s been around for a while. I also use the term “Aussie” loosely as (ahem) extensive research on the subject has taught me that this particular recipe probably has its origins in the southern states of the US. I like to imagine it was picked up by the Australian Woman’s Weekly in the 60’s as being seriously exotic and a dessert that could proudly take its place on the buffet table of the hostess with the mostest – right beside the punchbowl. I know what you’re thinking: not another variation on the lamington, the iced vovo or the pavlova – or even the iced vovo lamington. No, this is pure Aussie 60s/70s kitsch – and it was the height of hostessing fashion for a time. From the same decades that brought us devon slices filled with potato salad and skewered with a toothpick, little toast boats filled with creamed corn, vanilla slice made with sao biscuits, and tablecloths decorated with hobbytex, I bring you…ambrosia salad – a sickeningly sweet pina colada in dessert form. I can still see Mum preparing this dessert at our red brick house in Carlingford in suburban Sydney when I was a kid. At one point she had four of us under seven (I was the eldest), so I imagine anything that was quick and easy would have been at the top of her list. Ambrosia salad requires no cooking (so no need to turn the oven on and heat the house up), has no fiddly icing or fancy ingredients, no complicated processes, and can be served in the same bowl it’s prepared in – so no extra washing up. It’s no wonder that it was Mum’s go-to dessert for so many years. It’s all then mixed together and popped on the table as is. I remember thinking that it looked a little bit like…well, let’s not go there. The pic below will give you an idea – although Mum doesn’t put glace cherries on or in hers (thank goodness for small mercies). Although I wasn’t there for her birthday dinner on Tuesday evening, Mum put together a five cup salad for the occasion. In deference to the season, she used mango instead of mandarin. Very enterprising of her. Have you ever had (or heard of) ambrosia salad? I’m an author, so, therefore, I’m also a reader – it goes with the territory. I’ve recently done my budgets and added up just how much I spend each year on books and music – you don’t want to know the exact details, but here’s a spoiler alert: it could pay for a very nice holiday. It’s my red chair. We bought it, especially for me to read on. It sits in the corner of our bedroom under a chandelier. I always wanted a reading chair in the bedroom and now I have one. My dog has a cushion beside it so she can snore while I’m reading. It’s where I head for half an hour when I knock off from the partition job. Outside I read on the sun lounge beside the pool while I’m drying off, and on the pool lounge when I’m in the pool. I have the whole get settled on the inflatable and edge across to get the book and sunglasses thing down pat. I can float like that for hours. Oh, and I read in the bath too. I’m a corner folder…Shhh, don’t tell anyone. And if the book has a slipcover I have to take it off before I read it. I have a little table beside my reading chair just for my wine. I never eat while reading though. Nope. I tune out to everything. Multiple. I like to have different books for different moods. I usually have one real book…sometimes two…and one digital book…sometimes two…on the go. I’ve never had any issues with keeping up with each. I read mostly at home these days but will read on buses, trains, planes, on the beach, wherever. Silently – unless I’m reading Bill Bryson – then I can’t help but laugh out loud. I’ve been known to sob out loud too – but not to Bill Bryson. Yeah, my books are read and they’re loved. If the spine is broken in the process, it was for a good cause. Only Lonely Planet guides. I use highlighters on them too. “The Black Ship” in the Daisy Dalrymple series is on my kindle. I’m also reading “The Sunshine Sisters” by Jane Green. On my bedside table half finished is “The Little Paris Bookshop” and the Lonely Planet Guides to Paris, France and Belgium and Luxembourg. It would have to be one of the classics – Pride and Prejudice, Sense and Sensibility, The Buccaneers, or Wuthering Heights… actually anything by Jane Austen, Henry James or Edith Wharton. I re-read at least one of these at least once a year. As for everything else? I re-read “Something Borrowed” by Emily Giffin and “Eat, Pray,Love” by Elizabeth Gilbert a few times. When I think of favourites, I think of series. I enjoyed the Dalziel and Pascoe series, buy everything Ian Rankin does, loved the Phryne Fisher and Corinna Chapman series by Kerry Greenwood, the Murray Whelan series by Shane Maloney, the Daisy Dalrymple series by Carola Dunn, and Inspector Lynley by Elizabeth George…I probably should stop now, right? Oh, and Harry Potter – I love Harry Potter. Give up or read on if you don’t enjoy the book? I used to read on, these days I give up. Would you lend your books? Absolutely…unless it’s one of the above-mentioned series, I’m happy to pass them around and don’t mind if they don’t come back. Books find their way to those who need to read them. I sometimes think my annual wrap up or year in review posts are my favourite ones of all. You’ll find last years here. As for 2017? I’m going to wave it goodbye fondly – not in the way I waved 2016 goodbye, which was enthusiastically (and don’t ever think about setting your foot inside this door AGAIN…SLAM!) On the whole 2017 has been, relatively speaking, good to us. On my bucket list is to go to an AFL Grand Final – with extra points if Richmond or St Kilda were playing. We got pretty close to that this year – being in Melbourne on Grand Final day and joining in with the pre-match fun stuff in Tiger town aka Richmond. 2. What was your word for the year? How did you go with that? My word for 2017 was Adventure, and that’s what it was. Moving was an adventure, and once up here I’ve tried to approach exploring the region as a whole series of new adventures. 4. Did you keep your New Year’s Resolutions? Are you kidding? You’d think that I’d know better by now. My pack pain is heaps – and I mean heaps – better. I have no idea what my blood pressure is, but given that my heart no longer feels as though it’s beating its way out of my chest, that’s a good thing. I hit the fattest point I’ve ever been in 2017, so enough said about that one. Actually, I did pretty well on this. I revamped this site in October, and the astro site on the weekend. I kept a fairly consistent blogging schedule, although let the content slip on the astro site during November. I won’t look at the visitor stats until next week but suspect they’re down as I lost many readers from and anyways when I switched blogs and lost a heap from the astro blog when it was down for an extended period in the beginning of October. I wrote one book – I Want You Back – and am yet to publish it. It’s sitting there needing a blurb and some formatting. I haven’t looked at my sales figures since March, but given that the “royalties” are dribbling in, I’m still selling nowhere near what I should be. Having said that, I’ve done very little to attempt to change this situation and don’t want to talk about it again until 2018 thank you very much. I’m almost done with the first draft of my 5th novel. Nailed this. We had 2 weeks in Vietnam in April – immediately after moving house. Man, did we need it! We also had a couple of long weekends in Melbourne, an over-nighter to Bundaberg, and I had a mini-break in Wellington. 6. Did anyone close to you get married? 7. Did anyone close to you pass away? 8. How did you spend New Year’s Eve 2016? On our neighbour’s deck. We had nibblies, drank a lot of champagne and did everyone’s tarot cards for the year. She’s a scientist andI’m an astrologer so go figure. On a side note, they were pretty spot on. The two of us are available for hire. 9. How did you spend your birthday this year and how old were you? I came to Queensland for the weekend but on my actual birthday (Sunday) I had an early brekky with my family and then was on the mid-morning Jetstar flight back to Sydney to keep packing. My parents and two sisters came over in the afternoon for cake, I sold the sofa bed we’d been trying to sell and helped the buyer load it onto the trailer, and I had a couple of other potential buyers come in to look at some of the other furniture we were selling. Then I went next door for dinner and bubbles. It wasn’t by any means what I’d planned for my fiftieth birthday. I was all set to have a party, so I let one of my characters in I Want You Back have my denim themed party instead. 10. What would you like to have more of next year that you lacked in this one? 11. Did you tick anything off your bucket list this year? 12. What dates from this year will remain etched in your memory and why? March was mental. All of it. We moved, we unpacked, we went to Vietnam – all in the space of less than a week. Oh, and the day after we went to Vietnam leaving our 19-year-old in a brand new house ex-Cyclone Debbie hit and took out the power for 3 days – and the contents of the fridge and freezer we’d just stocked. Sarah wasn’t worried about the lack of power but was concerned about the number of geckos. 21/1/17 We inspected the house we now live in and after 5 minutes of earnest discussion at Mooloolaba Surf Club put an offer in on it. We love it to pieces. 22/3/17 Watching the movers drive away from Castle Hill and our home of nearly 18 years. Mum came and helped me clean and after she left I remember sitting on the carpet in the empty lounge room with my laptop, drinking red wine out of a coffee mug. Shutting the door and leaving the keys on the bench was surreal. Again my neighbour came to the rescue with dinner, bubbles and a lift to the hotel I was spending the night in. I flew out early the next morning to join my family in Queensland. I didn’t cry until I saw Grant at the airport the next morning – and I’m sure that was more tears of exhaustion than anything else. 26/8/17 “Buzzing” the Pt Cartwright lighthouse in the bi-plane. Such a, (sorry), buzz. 13. What was your biggest achievement of the year? Getting the nod to speak at this year’s Romance Writer Conference – and getting paid for it! 14. What did you learn this year? That I’m busy, but not necessarily as productive as I could be. Even though I took 2 weeks off in 2017 and went to Vietnam, I had freelance astro commitments and self-imposed book deadlines that meant I was still working. I need to completely stop at some point in 2018. Self-care is an entirely different concept from self–nurturing. I’m good at the latter, not so much with the tough love aspect of the former. Losing an entire salary for the first 7 months of 2017 proved to us the importance of financial planning and having a buffer. 15. Did you suffer illness or injury? Nope, touch wood…just a few days with a head cold in May. 16. What was the best movie you saw all year? Didn’t go to the movies all year…next question? 17. What song was on high rotation this year? I’m in the middle of writing, and Ed Sheeran’s “Perfect” and Katie Melua’s “I Think It’s Going To Rain Today” are on the playlist for the new book. When I was writing I Want You Back, Adele’s “When We Were Young” and Mika’s “Any Other World” was being played a lot. I’m loving Vance Joy’s “Lay It On Me” and I’ve just downloaded a couple of albums by Danish Singer/Songwriter Agnes Obel. This year I’ve also added albums by Vance Joy, Ed Sheeran, Nick Cunningham, Ziggy Alberts, Ben Howard, Mark Wilkinson, Angus and Julia Stone, Jack Johnson, Jamie Lawson, Passenger, Oh Wonder, and The London Philharmonic Orchestra. 18. Where did your money go this year? Ummmm books and music! And travel – mostly for my trip to France next year. Did I mention I’m going to France in April? Happier. Definitely less stressed, less anxious and more contented. There’s no comparison. Poorer, relatively speaking, but richer in terms of contentment. Beating myself up for eating too much, drinking too much, not exercising enough, and not being productive enough. Lunch was with my extended family at my sister’s house. The evening was spent at our place with our neighbours, a bucket of prawns and about the same quantity of bubbles. There’s a pattern here with my neighbour and bubbles. 23. Did you fall in love this year? Yep, with the Sunshine Coast. For the first time in my life, I feel as though I’m home and settled. It doesn’t mean that I’m done travelling, but that I’m done wondering where I belong – because it’s here. According to Goodreads, so far I’ve read 94 books in 2017 – that doesn’t count the short genre romances I didn’t bother popping into Goodreads. According to my ratings, it was a fabulous reading year. I did have a few books that I put aside without finishing and without a rating – but we’re not mentioning them. 25. What TV shows did you watch? I’ve just finished binging on Season 2 of “The Crown”. Other than that I loved “Shetland”, “Hinterland”, “Doctor Blake”, “Designated Survivor”, and “Victoria”. I also re-watched “The Good Wife” and “Midsomer Murders”. 26. Who did I miss this year? Friends and family left back in Sydney…but not enough to even consider looking backwards! What I certainly didn’t miss was the daily 3-hour commute. I still try and have a Friday night vino with my neighbour – although these days it’s a virtual vino. I also missed dumplings…does that count? 27. What kept you sane this year? Kali, Adventure Spaniel snoring under my desk and walks along the beach most weekday mornings. It’s such a treat living so close to Mooloolaba – we’re about 10-15mins drive away. I never thought I’d be able to see the beach every day, but now I can. As a kid growing up in country NSW, we would spend Christmas at either my paternal grandparent’s house in Tumbarumba (in southern NSW) or in Sydney with my mother’s family. Mum would pile all four kids, two dogs, the cat, the expertly hidden Christmas presents, a couple of loaves of white bread she’d made up into devon and tomato sauce sandwiches, ice cream containers for when the middle sister got sick, and one of those foam flasks made up with cordial into the station wagon. Once Dad was on the road, he didn’t stop – except for petrol. When we were living in Merriwa (in the Hunter Valley), the hot ten-hour drive to Tumbarumba was dreaded, while the Sydney run on the alternate year was less daunting. When we were in Bombala (in Southern NSW), it was the opposite. I don’t remember much about the Christmases we spent in Sydney. As a kid I was asthmatic and my throat would seize up from all the cigarette smoke in Nan’s house. We slept on the floor and I would spend most of the visit wheezing and struggling for breath. I loved Nan and my Sydney family but grew to dread those visits because of the asthma. The Tumba years I’m clearer on and have much fonder memories of. I remember the dry heat, afternoons at the town pool and the Boxing Day cricket test on the ABC as the portable air cooler tried vainly to do something other than making a noise. I remember the year a cold snap came through and it snowed at Laurel Hill just outside town. It was the closest to a White Christmas I’ve ever had. I remember the ham salad suppers, and the time all my illusions were shattered when I saw that the trout that Poppa had said he hit over the head with a piece of 4 b 2 when it came up for air in the Tumbarumba River, had actually been purchased from Snowy River Fisheries. On the way home, we’d buy boxes of cherries at Young and spit the seeds out the window, red cherry juice dripping down our chins. Dad would warn us not to get the juice on the fabric seats. When we got home we’d have to help Mum pit and bottle the rest so we could enjoy preserved cherries all year round. There was no air conditioning in the car, so the windows would be wide open and we’d argue about who got to sit next to one. Inevitably someone would throw up – usually the middle sister. Then we’d all get in trouble because Dad couldn’t hear the cricket on the radio. Regardless of where we spent Christmas, the Christmas morning ritual remained the same. We’d go to bed early, with a red plastic hessian Santa sack on the bottom of the bed. Sometime in the middle of the night we’d wake and feel the weight on our legs as Santa had crept in while we were asleep and filled the bags. Dad would start patrolling the hallway from about 5 am looking for the first sign that one of us might be waking. Mum would tell us not to eat any of the chocolate before breakfast because apparently, that’s how you get worms. These days we’re all partnered or kidded up, but Santa still brings a stocking of chocolates for each of us – four get left at the front door of Mum and Dad’s Sydney home. For many years after we as a family moved back to Sydney – the year I was in Year 12 – Christmas lunch would be at Mum and Dad’s for whoever didn’t have to spend it with in-laws. For the last few years, it’s been at my sister’s with everyone pitching in and bringing something. My husband is in charge of the trifle. As the kids got more numerous, bigger, and noisier it made sense. Our day would start with potato scones, champagne and carols at our house as we opened pressies. We’d then head over for Christmas lunch, returning late in the afternoon for prawns and more bubbles on the deck with our next-door neighbours. Round two we used to call it. This year it’s different. We’ve moved to Queensland and want our first Christmas here to be here. I’m looking forward to the preparations and the cooking. I’m even looking forward to lining up just after midnight on Christmas Eve morning to get the prawns and smoked salmon. We have friends over from NZ to spend it with us and while I’ll miss family, it’s exciting to be doing something different in a place we love with people we love. And I guess that’s the whole point of it – spending time with people you love. What about you? What are your Christmas memories? October. It was a month of family birthdays, of more rain than I’ve seen in a long time, of bad days in the office, and a lot of miles – both air mails and road miles. Aside from getting through a mountain of stuff in the day job, I finished my copy edit for my new novel, agreed the cover, and signed off on a new logo and social media banner. Anyways, here’s the month that was October. 1. Marvellous Melbourne – catch-up with an authorly friend, lots of steps and dumplings. 2. Home again – and some much needed rain. 3. More rain – and some planting in the rain. 4. Belly dancing starts back – shimmy shimmy. 5. End of month reporting in the corporate gig and a late afternoon coffee with a friend. 6. Haircut and Guru Life for lunch – there’s no connection between the two. 7. Markets, housework, and an afternoon cooking – including a spiced ginger cake from my new Darren Purchese cookbook. The recipe is here. 8. Checked out Rick’s Garage at Palmwoods for lunch and a late afternoon visit from a Sydney colleague. 9. Morning walk, evening walk, gym in my lunch hour – and a full day in the office. 10. Whales off the beach this morning – what a great start to the day. Followed by a talk on the health of the reefs around the Sunshine Coast with Reef Check Australia. 11. Best whale off the beach sighting yet this season. 12. Awful long, long, long, day in the office – my head hurts. 13. Lunch at Chances – fabulous mussels in laksa broth. 14. Maryborough and Bundaberg, Mary Poppins and rum…and rain, lots of rain. 15. Bargara and a drive past Hervey Bay – and more rain. 16. More rain – in fact we’ve had 3 times the October average rainfall in just 3 days – with more on the way. 17. More rain, flight to Sydney delayed. 18. Sydney, for work…enough said. 19. In the office office and a catch-up with one of my besties for dinner. 20. Home – to the sun. 21. Guess what, it’s raining again – a great day to whip up an Indonesian feast: chicken satays, beef rendang and coconut ice cream all from scratch. 22. Bar snacks and cocktails at Hong Sa at The Spirit House – an early birthday lunch for hubby. 23. Long and awful day in the office. This is becoming a habit. 24. Take yesterday and repeat – but with sun. 25. Belly dancing – I’ve missed the last 2 weeks due to work. We did things with sticks. 26. Happy birthday to my wonderful hubby. Dinner at Bella Venezia at Mooloolaba to celebrate. 27. Nailed my copy edit. 29. Shopping in the city, Christmas ornaments, and a family catch-up to celebrate my Dad’s birthday. 30. Man, it’s hot! Up to 36C today with a southerly this evening. I have a headache. 31. Still in Sydney, still have a headache. I want to go home.